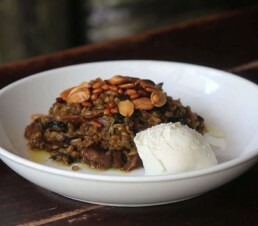 Serve the freekeh on a plate and using a spoon, drizzle a little ghee and some fried nuts on top of the freekeh and lamb. Place a dollop of fresh labne on the side. Using a mortar and pestle, crush down the coriander, pimento, fenugreek, pepper, cardamom and fennel seeds to combine. To cook the shanks, place them in a large pot with the crushed spices, salt, cassia, bay leaves, lemon, onion, molasses and wine. Cover the shanks completely with cold water. Cover the shanks and place on the stove on a medium-high heat. Once the water starts to boil, reduce the heat to low and simmer for about 3-3.5 hours just until the shanks start to fall off the bone. Whilst the shanks are cooking, place the freekeh in a bowl and rinse under warm water and drain. Repeat this process. You will notice that there may be burnt freekeh that will float or other husks that can be discarded. Once you have drained the freekeh the second time, leave it in the strainer to dry as much as possible before using it. Drying time should take about 30 minutes in a cool area. Once the shanks are cooked, remove them from the pot and strain the remaining liquid, reserving it to cook the freekeh. Place 110g of the ghee in a large saucepan and melt over a medium heat. Add the diced onion to the pan and sauté for a few minutes. Add the zucchini and the jews mallow and cook until the leaves have softened slightly, about 3-4 minutes. Add the freekeh, stir and combine the ingredients in the pan to coat the freekeh with the ghee. Add enough of the reserved liquid stock to the freekeh to cover it liberally (about 800ml). Cover the pot, reduce the heat to low and cook the freekeh for about 45 minutes until it has absorbed all the liquid, stirring every 5 or so minutes to avoid it sticking to the pan. Pull the lamb off the bones and place in the pan with the freekeh, stirring it through the grains and vegetables. Melt the remaining ghee in a small fry pan over a high heat. Add the almonds and fry until just as they go golden. Add the pine nuts to the pan and fry the nuts just until they start to brown. Set aside.